Photography Courtesy of Lake Tahoe Hyatt Regency, Denise Hummel and Kerry at www.gowhitewater.com. We took our time meandering back to the entrance of the Park to head northbound to Lake Tahoe, stopping along the way in the numerous green fields to throw a football and take in the majestic towering cliffs surrounding us. 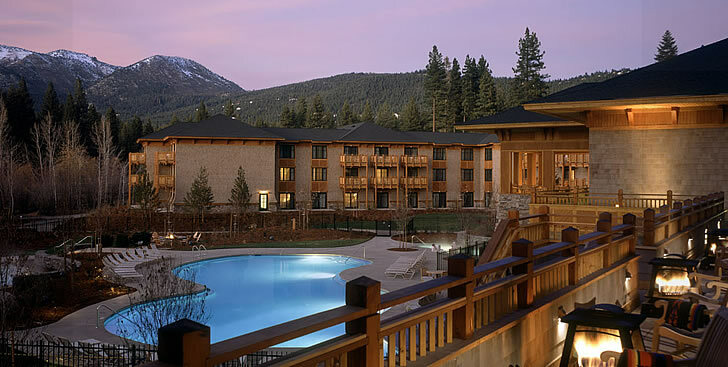 After a good night�s rest, we were ready to enjoy North Lake Tahoe and the wonderful amenities of the Lake Tahoe Hyatt Regency. 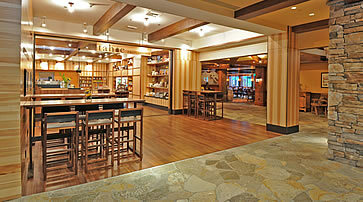 A clutch decision, and one that I�ll use the next time I frequent a Hyatt, was to choose a Regency Club floor. The rooms on this floor are only slightly more expensive, and the amenities more than worth the extra change. A complimentary continental breakfast is served from 7-10:30, a plethora of snacks from 11-2, and a happy hour with marinated shrimp, a variety of cheeses, roasted vegetables, a Caesar salad or other scrumptious food always awaited, as did a choice of beer, wine, and soft drinks. The Club room also contained two computers with free internet service. 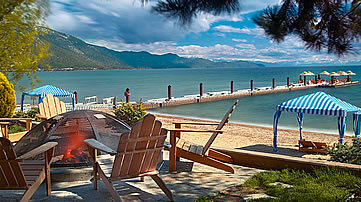 Apart from the Club Room, there�s still the Spa, Sports Bar, and Casino to partake in, not to mention the bar on the pier, surrounded by wooden rocking chairs that face the lake (while rocking on the pier above the lake), the private beach with tented cabanas, the night-caps by the outdoor fire pits. 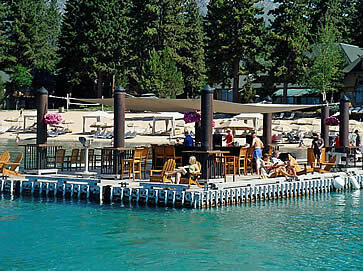 Last, but by no means least, their restaurant, the Lone Eagle Grille had the same awe-inspiring view of the lake and surrounding mountains � indoor or outdoor seating. I had a seared duck breast with baby spinach, pears and warm aromatic spices followed by buffalo tenderloin, parsley whipped potatoes, grilled leeks and foi gras demi-glace. Phenomenal. While I truly could have spent my time, no more than 50 feet from the pier bar or the beach, there are so many adventures to be had on this lake, that one really does not to summon the energy to enjoy the captivating view from other vantage points � like 1400 feet above it, for example. 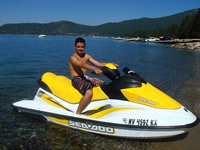 We had a blast sailing on the Sierra Cloud (the hotel�s 55 foot catamaran) and jet skiing from the hotel�s private beach, Action Water Sports, but that was hardly the end of the excitement. 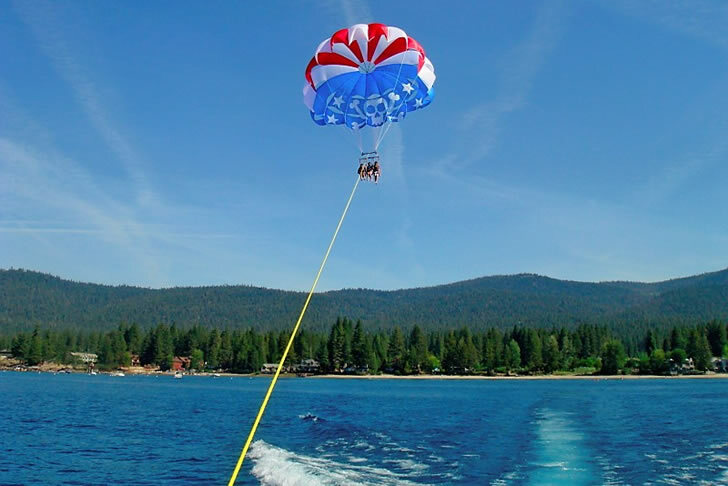 Next, we parasailed with North Tahoe Watersports. The technology has come so far that we merely snapped into our harness, stepped on to a platform on the stern of the ship, and waited for the winch to let out line, up, 500 feet, 800 feet, 1400 feet � and at that point � talk about a view � 360 degrees of Lake Tahoe, literally bird�s eye. Elating to say the least, and since we could go up three at a time, I was flanked by my two boys � a memory to last a life time. As if all this were not enough, we also went white-water rafting on the Truckee River with Tahoe White Water Tours. I�m not sure if the kids liked the �successful� moments more, or the one time we got hung up on a rock with water cascading into the raft as our team leader wrestled the raft to get us off � major adrenaline-building, with the appearance, though not the reality, of danger.